Yesterday I took Bryce to the ENT to have his adenoids checked. At our last clinic I had mentioned to Bryce's pulmonary doctor that he "mouth breathes" all the time and as a result doesn't have the freshest breath sometimes. After checking his nose for pollups (common in kids with CF) and looking at his throat she said that his throat had a lot of "gunk" and looked a little irritated. She also said that the "gunk" in his throat was coming from the front side under the adenoids which made her wonder if his adenoids were enlarged. She recommended that I take him to see an ENT and said it was a good idea to have a relationship with an ENT anyway. Our pulm doc recommended PENTA (Pediatric ENT Atlanta) and much to my surprise they have several offices located around metro Atlanta with one being in Marietta. Hooray...no driving to Atlanta for this appointment! After meeting with the ENT and discussing my concerns he definitely wanted to check out the adenoids. In order for him to check the adenoids Bryce had to be scoped which is where they stick a tube that has a light and camera on the end up each side of his nose. I was told that it doesn't hurt, but it is uncomfortable. To help with the uncomfortableness they sprayed a numbing spray on inside of his nose. Apparently this tastes really bad so he was able to follow up the spray with a lollipop (he actually had two!). Bryce handled the scope like a champ with minimal whining. I held him in a bear hug and a nurse held his head in place while the doc put the tube up each side of his nose. Thankfully he was pretty fast because it didn't look like it felt good at all. I was proud of Bryce for being such a trooper. Taking in the view while eating his lollipop. Bryce's adenoids look great. They are normal size with no enlargement at all. What the ENT did see was that the sinus pockets under the eyes were full of that lovely sticky CF mucus. They are so full that they are "bulging" into his nasal passages which is what causes his noisy breathing (our very own Darth Vader) and mouth breathing (which aids in his dry chapped lips). The result is that it's easier for Bryce to breath through his mouth than his nose. Chronic sinus issues is very common with CFers and this is what Bryce has been dealing with for the past year or so. The ENT said the best line of defense for now is to keep up the saline nasal rinses. He said that down the road if the issue becomes worse and Bryce has trouble breathing or he starts to have lung issues they can go in and clean the sinuses out, but ultimately they will fill back up (usually within a months time). So, our plan of attack it to keep up the nasal rinses, but do them more frequently each day. He typically does one per day, but I think we will start doing 2 and on days he really sounds congested we might do more. Not familiar with nasal rinses. Here is a little video of Bryce demonstrating the process. He uses the squirt bottle verses the NetiPot because it has the force behind it to push out all that sticky mucus. I actually prefer the bottle to the NetiPot myself. The bottle is made by the same company as the NetiPot. It was a complete pleasure speaking with a doctor that actually knew about CF. When I go to our pediatrician they look at me like deer in headlights when talking about Bryce. I've actually been thinking of switching practices because they are that clueless about CF. In their defense I was told from the get go that they didn't know much about CF, but wouldn't you want to read up on CF a little if you knew one of your patience had it? Maybe I expect too much, but seriously. I really enjoyed speaking with this ENT and his NP because they were so knowledgeable and clearly had experience with CF patients. It was so nice for someone to speak "our language". Highly recommend Dr. Sipp to any of our local CF friends. He is at the Marrieta PENTA location and he was excellent. We live on sinus rinses. Avoid surgery as long as possible!! 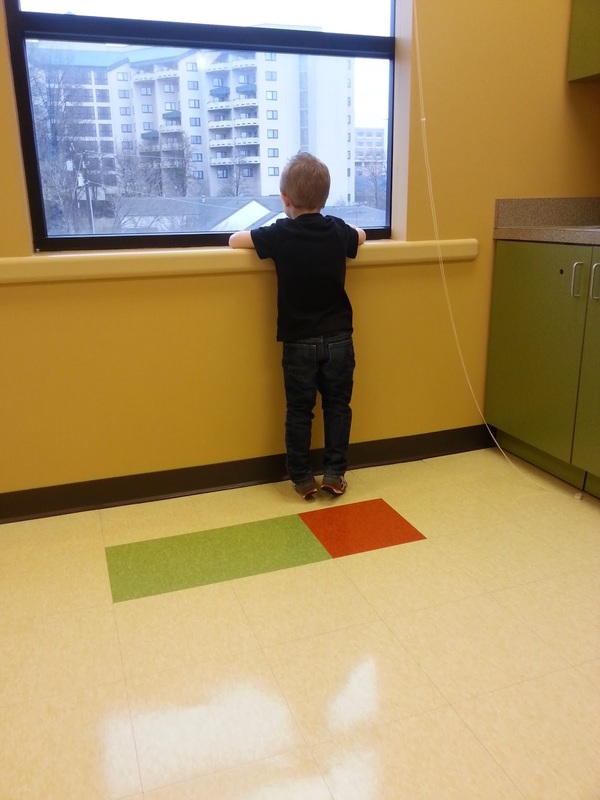 Aidan couldn't lift his head at age 1 and surgery wasn't avoidable. But now its constant surgeries…he just had his 13th one :( He has to do constant IVs for the infections. CF sinuses stink.